Rubies is a handy ballet to have in the repertoire as your 40th Anniversary comes around. It’s fiendishly tricky, the jazzy music (Stravinsky) pushing the dancers to take risks if they dare. It’s not that long ago that the Royal Ballet’s (now retired) Alexandra Ansanelli took extreme risks with balance, strength and speed to electrifying effect, and before her Sarah Lamb who looked positively at home with the choreography. As indeed they both should be, given their American backgrounds, perhaps more so that the Royal themselves. Balanchine is demanding – there can be no “going through the motions”, and overall Scottish Ballet danced a very accomplished, musical Rubies. Sophie Martin and Adam Blyde are slightly mis-matched; she has a strong technique with great hands, but her feet were too soft and her partner could have been more attentive. Sharper was Vassilissa Levtonova who was infectiously enjoying herself throughout. The corp showed how witty & glamorous they are, while the men were strong, timing very good – it’s not always the case that they are as synchronised as this which shows good rehearsals and preparation. Workwithinwork, choreographed by William Forsythe & new to the Company, takes a little more getting used to. The music is hard to listen to, a lot less tuneful, but the dancers seemed more at home with the shapes and turns in this piece. Ingenious use of the minimal sets too – so often in modern works you find yourself watching a series of slow entrances and exits; not so here, where the dancers use the stage and the set to come and go unobtrusively - and that’s partly what the work is about. The patterns shifted all the time so that a patch of the stage was filled with people while another corner gradually emptied, and by the time your attention was drawn to a different area of the stage, the dancers were already there. The costumes were flattering and in good colours – always nice to see a bit of sparkle, and purple seems to work well every time. It’s a moody piece, to Luciano Berio’s Duetti for two violins. They saved the best till last. The beginning of In Light and Shadow, to Bach’s Goldberg Variations, had me thinking I was stuck in a Groundhog Day - it was only last week that this music was used in Kim Brandstrup’s new work for Tamara Rojo. But Aria, danced perfectly by Claire Robertson and William Smith, used the music to greater effect - atmospheric but peaceful, slow and fluid and more classical in style. 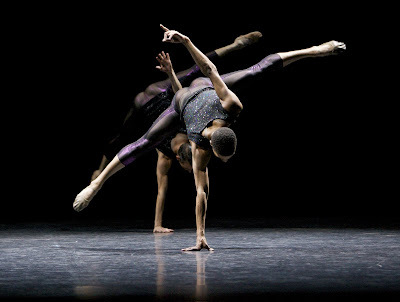 It’s a ballet of two contrasts, and moves into the lighter Suite No 3 in D from Bach’s Orchestral Suites, where there is colour contrast in the costumes and a vibrant buzz from the dancers. I particularly liked the Gavotte, danced by Martina Forioso and Luke Ahmet, and in the Company sections, you couldn’t fail to notice Paul Liburd, an exceptional mover, even more so given his costume – a peculiar part skirt/part hospital gown arrangement that wouldn’t have looked out of place on the catwalk. Costumes with swags ? For men ? Actually, the costumes were very inventive and used to great effect, particularly a long ballgown, batted out of the way by her partner and used by both dancers throughout as additional points of reference, and very popular with the audience. I absolutely loved Krzysztof Pastor’s choreography where the dancers are lit only from the knee down, showing off their brilliant, precise, synchronised footwork to perfection. If they’d burst into Scottish dancing I wouldn’t have been surprised; the music is swooping and joyful ! Many of the movements began in the difficult 5th position, showing supreme control and balance. It’s been a delight having the Company in town, albeit for just a few days. I hope it won’t be long before they are back to show us more innovative, bold and interesting work. A Very Happy Anniversary to the Company. Wonderful photos of superb dancers! Thanks for sharing. gotta love these photos thanks for sharing and posting this . Thanks for visiting my blog. I love your pic's, Ballet, such Grace. I love it. Just wanted to thank you for stopping by and leaving a kind comment. It is great to meet you and how envious I am of your life writing about ballet and reviewing performances. Although not a ballerina, I have always been mezmerized by this dance form. Looking forward to following your blog and learning more about it. Thanks again! Hi Elise, Thank you for posting on my blog..that was very sweet of you! I so enjoyed looking at the ballet pictures on your blog..they are wonderful..so beautiful and graceful.. i always loved watching dance. It is nice to meet you and I hope we keep in touch! I have a friend who many years ago danced with the Irish ballet. I shall pass on details of your great site. I'm sure she'd enjoy it. The photos are just amazing, makes me wanna' dance and see a ballet play right now! Thank you for the kind message you left on my blog. In Light and Shadow looks just beautiful, all these descriptions and memories make me want to take ballet classes again, if only there were (re)starter ones for adults! Lovely photos of the dancers. Ballet is such a symphony of body movements. Love to watch it. A beautiful post - those dancers are amazing and how I wish I had trained as a theatre costume designer - I would have loved to work with those gorgeous outfits!! Thanks for popping in to my blog. thank you for your kind comments on my blog! I have enjoyed seeing all the beautiful dancers here! :) beautiful ballet photos! phonelady - thank you and hope you are feeling better now ? Wizard of Was - love the name ! Welcome and thank you for your comments and for forwarding my link to your daughter. I hope she and your granddaughter enjoy it too ! Folksie Linda - nice to meet you too, and thank you ! Jan - thank you for your comment and for forwarding my link to your friend. Vicki - thank you very much. Do let me know what you go to see in Belfast won't you ? The Vintage Kitten - thank you - don't they just ? Kathy - welcome and thank you ! Clarity - it was beautiful ! I'm sure there are you know - and adult classes are very popular now. Basyon - thank you ! Nancy Maxwell James - thank you ! I love all the pictures you post; they're so beautiful to look at!